(CNN) -- The collapse of the U.S. economy has dominated the first months of Barack Obama's presidency. 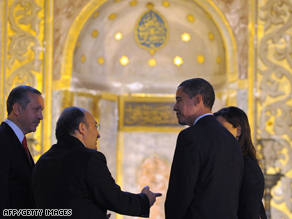 Obama (second right) at the Hagia Sophia in Istanbul during his bridge-building and sight-seeing trip to Turkey. But after last week's G-20 summit in London, Obama was in Turkey and Iraq this week, underscoring a different point. Once he's taken care of problems at home, most of his biggest business is in the Muslim world. Iraq: Obama owes his election in part to his opposition to the war in Iraq. Now, he plans to withdraw U.S. combat troops. But Iraq is still so dangerous that Obama had to keep his visit a surprise and be content with a quick look from behind U.S. barbed wire. Will U.S. forces really be able to back out? Afghanistan: Obama has made this war his own, vowing to win, promising to keep terrorists from again taking refuge on Afghan soil. Even after more than seven years of fighting, the challenge is daunting and some Americans are already musing about whether it will be 'Obama's Vietnam'. Pakistan: The Obama administration sees Pakistan as both a base for insurgents in Afghanistan and a battleground in its own right. Militants threaten the stability of the country and also potentially the security of its nuclear weapons. What's the best way for Obama to respond? Iran: Tehran is proudly pursuing a nuclear program. It insists its intentions are peaceful, but Western experts are alarmed. Obama has pledged to explore every option "including military, to prevent them from obtaining a nuclear weapon". Will he have to make good on that threat? Turkey: The only Muslim nation in NATO, Turkey represents moderate Muslim opinion that was troubled by the U.S. war on terror but still wants to work with the West. America needs to win back mainstream Muslim support. The Palestinians: Every conversation about Washington and the Muslim world eventually leads to the same place. On the list of challenges, progress for the Palestinians is the challenge Muslims themselves are probably watching most closely. Success may seem remote, but it would resonate for generations worldwide. Obama has a big agenda to address during his presidency. Put these half dozen close to the top.